But the Young Turks are just one of many factions that comprise the Democratic Party, which itself represents a two-decade struggle to redefine the Italian left — the party is now comprised of over a dozen fiefdoms, including the so-called ‘renziani‘ who support the Florence mayor. Some of the tribes have been thoroughly opposed to Renzi’s project from the beginning, including the ‘Young Turks,’ the leftist dalemiani, the followers of former prime minister and foreign minister Massimo D’Alema, with roots in the old Italian Community Party; the ‘bersaniani,’ social democratic followers of Bersani, with its roots Italy’s labor unions; and, to a lesser degree, the ‘lettiani,‘ the liberal reformists who support the current prime minister. Other factions have been more amenable to Renzi, including the ‘franceschiniani,’ followers of former PD leader Dario Franceschini, with roots in the old Italian Christian Democracy; and the ‘veltroniani,’ followers of the PD’s founder and first leader, former Rome mayor Walter Veltroni, a moderate whose vision for the Italian center-left was something akin to the Democratic Party in the United States. That’s not counting the Sinistra Ecologia Libertà (SEL, Left Ecology Freedom), the democratic socialist party founded by Puglia regional president Nichi Vendola, which presents another potential headache for Renzi. 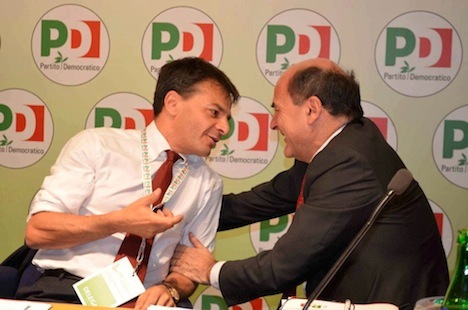 Though the SEL supported Bersani for prime minister and joined the broad centrosinistra coalition for the February 2013 parliamentary elections, the SEL declined to follow Letta and the Democratic Party into government. It’s an open question whether the SEL could join forces with Renzi in future elections — there’s a chance that Fassina and like-minded leftists could bolt the Democratic Party to merge with Vendola’s SEL. Back in 2012, Renzi waged his campaign for prime minister with another strategy from the Clinton playbook — triangulation. Renzi positioned himself as a ‘third way’ centrist with the goal of marking a generational and policy rupture from elites on both the Italian left and right, essentially pitting himself against Bersani and D’Alema in his own party as much as against former centrodestra (center-right) prime minister Silvio Berlusconi. It’s a strategy that paid off handsomely for Beppe Grillo, whose pox-on-both-houses protest led his nascent Movimento 5 Stelle (M5S, the Five Star Movement) to such a great result in the 2013 elections. But now that the Democratic Party is leading Italy’s government, Renzi’s strategic path is much trickier. As an agent of political change, he has to remain far enough away from Letta and the current government to retain his outsider appeal (and to ensure that he, and not Letta, is the centrosinistra‘s candidate for prime minister in the next elections, whenever they occur). Yet as the leader of the Democratic Party, he certainly can’t be seen as sabotaging Letta’s government for the sake of winning power in his own right, especially with so many elements within the party skeptical or downright hostile to Renzi. It’s even trickier because Renzi has called for the kind of labor market and economic reforms that Letta himself is trying to enact as prime minister over the opposition of Berlusconi’s Forza Italia (which no longer support the government), the Five-Star Movement, reluctant leftists in his own government, including Fassina. First, he has to keep the Democratic Party (and its electoral coalition with the SEL) united while pulling it even further to the center. Second, he has to retain his populist, ‘outsider’ appeal, which means that he has to criticize the government that his own party leads without seeming too disloyal or too calculating. Third, he has to ‘defeat’ Letta to become the undisputed leader of the centrosinistra, also without seeming disloyal or calculating. Finally, and most importantly, he must continue to embrace difficult economic and labor market reforms, though his criticism of the Letta government makes it less likely that Letta can push those reforms through the Italian parliament, which not only seems disloyal but detrimental to Italy’s future. Renzi essentially has to bring down Letta’s government and sabotage the chance of economic reform, all so that he can lead the Democratic Party to victory, presumably in order to attempt the economic reforms that Letta (and former technocratic prime minister Mario Monti before him) have been desperate to enact for the past two years. It would be a tricky maneuver for any politician, and polls show that Renzi might have already peaked. A January 14 IPSOS poll shows that while Renzi’s Democrats are the leading party (33.4%), the centrosinistra (including SEL) would win 36.1% to just 35.2% for the centrodestra, essentially a dead heat. Grillo’s Five Star Movement still attracts an impressive 20.7% share of the vote. The centrodestra today includes Berlusconi’s Forza Italia, which no longer supports the Letta coalition; the Nuovo Centrodestra (NCD, New Center-Right) of deputy prime minister Angelino Alfano, which does support the coalition; and the autonomist Lega Nord (Northern League), which never supported the coalition. Berlusconi’s rump party would win 23%, Alfano’s breakaway party wins 6.5% and the Lega Nord would win 3.2%.